I don’t really like sandwiches. My co-workers look at me quixotically every time I make this declaration, which is whenever we have a lunchtime meeting and this is the only option on the table. But a recent visit to Bird’s Eye Sandwich Shop has me rethinking my position. 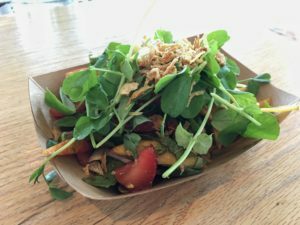 Bird’s Eye is a Friday- Sunday pop-up located within Doi Moi, the Southeast Asian restaurant on 14th Street. 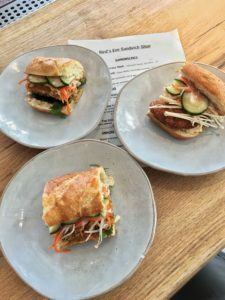 Executive Chef Sasha Felikson has concocted a concise menu featuring sandwiches inspired by banh mi, the Vietnamese baguette typically served with a protein, pickled vegetables, and herbs. If you converse with Felikson, or simply observe him in action, you can sense the energy and passion he puts into his food. Banh mi sandwiches are a favorite of the chef’s, mostly because it’s a vegetable sandwich garnished with meat. “I think using more vegetables is one of the coolest things you can do in cooking, especially in America,” says Felikson. Bird’s Eye features three variations of banh mi. Thai roasted pork is topped with crispy shallots and marinated cucumber. There’s also a savory rice cake with enoki mushroom, carrots, and daikon pickles. The version that leaves a sandwich skeptic like me wanting more, is crispy chicken thigh topped with chili honey, herbs, and soy mayo. The fried chicken sandwich is essential to the Bird’s Eye menu. “If you don’t have a fried chicken sandwich in DC, I don’t know what you’re doing. You’re pretty much the worst chef in the world,” quips Felikson. One of the reasons I’ve withheld my affection for sandwiches is because the bread is a vehicle- often a soggy one- rather than an enhancement. Felikson uses bread from Gold Crust Bakery in Landover, Maryland, which he selected after conducting extensive research to find something that toasted well and held up to the ingredients. Supporting a local business is also important to the chef. He has chosen well. The crusty bread elevates the sandwich, and kewpie Japanese mayo as a condiment is the icing on the cake. So to speak. 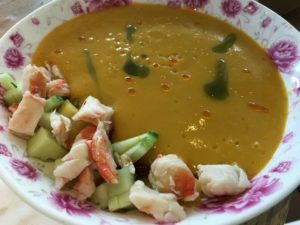 In addition to sandwiches, the menu at Bird’s Eye Sandwich Shop includes miso chicken noodle soup and a vibrant chilled mango Thai chili soup with pickled shrimp and tomato salad. Stone fruit salad- most likely on its way out now- is delightful for a hot summer day and it’s nice to have something light to balance out against the sandwich. On the other hand, curry fries with Thai ranch sauce are excellent, and not something to pass up. Spice levels on all Felikson’s dishes are just right- there’s heat but not an over abundance of fire. Bird’s Eye has given me a new perspective. I’m stuck between my admiration for the bread and the stellar contents inside, but that’s a sandwich I don’t mind at all. *My meal at Birds Eye Sandwich was complimentary. Stay tuned for an upcoming interview with Chef Sasha Felikson on the Jewish Food Experience website.